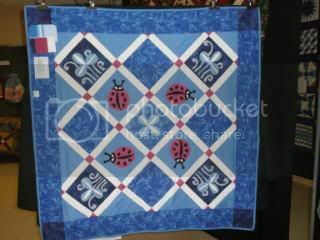 I belong to a quilt group that was founded at my workplace and we have been merrily stitching along for 10 years. There are currently 12 members in the group. 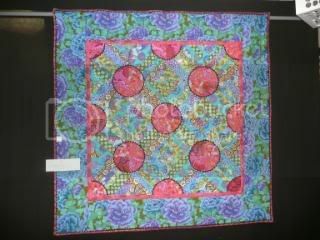 We decided our 10th Anniversary called for a celebration of our collective abilities and we should hold a quilt show/ display . 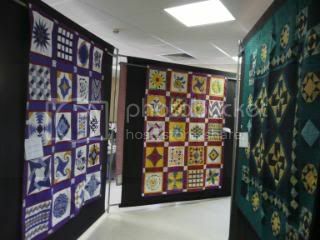 One of the larger groups in our region kindly donated the use of their professional quilt hangers which helped to make the whole display look so much better - and we would have run out of wall space without it ! 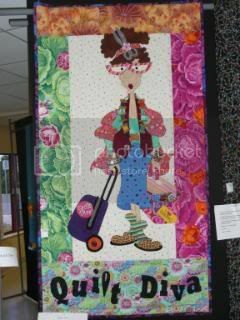 A local quilter who judges quilts on a State Guild level kindly came and judged the quilts . 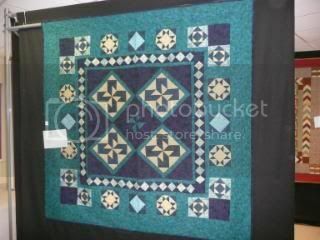 It was very interesting to read her comment sheet and to see the criteria used to judge a quilt; design elements, Colour ( impact,harmonies,interaction), Visual Impact,Techniques ( workmanship) , Presentation( finishing, how the piece hangs), Best Feature, Areas for improvement. It was amazing to see our work on display. We have all progressed from the first meeting when we did not know what a fat quarter was or a 9 patch for that matter ! Everyone attending the show was able to vote for the Viewer's Choice Award ...but that was a non contest really. 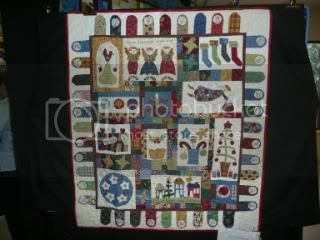 Corrie ( founding member) won with her stunning William Morris Hand appliqued quilt . 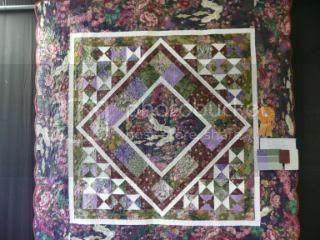 Edit: I neglected to note that the William Morris inspired quilt was designed by Michelle Hill...who has somehow found my humble blog and left me a comment...wow ! 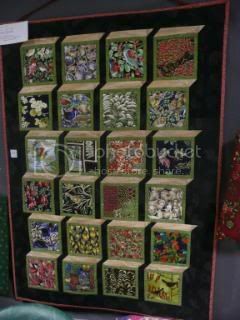 If you belong to a group that has enough quilts between you to have a display...go ahead and do it ! 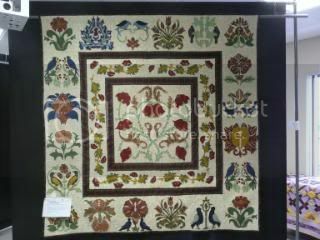 We were all a bit wary of the idea at first as no one felt their quilts were up to display standard but it was so worth the effort...and it was lovely to hear all the comments from the visitors. We all enjoyed the experience so much that we will hold the show bi-annually as a fundraiser for charity. Well done each and every one of you, I really love to see guilds, regardless of size, having exhibitions it's a healthy thing for our craft. Your added bonus was having it judged which always gives constructive feedback. Fantastic!!!!!! What a great achievement it is to host such an event, showcasing such amazing work. Your show looks great! It's really inspiring.